Following is a quote from an experienced rider who believes that he might be able to eliminate a problem he is having with his rear tire when he hard brakes by replacing that tire with a larger one. ... My rear wheel tends to skid and squall rather easily when I am in a hard stopping situation, but it stops straight and doesn't cause any problem. The extra rear tire width has got to help with this. Though it will help to have a larger (mass-wise) tire on the rear to minimize the 'skid and squall' he mentioned, it will not eliminate that problem because it is not the source of the problem. I thought you might like to understand what is actually happening to cause it. When you accelerate your scoot the back-end RISES, not falls. This is true for virtually any bike. 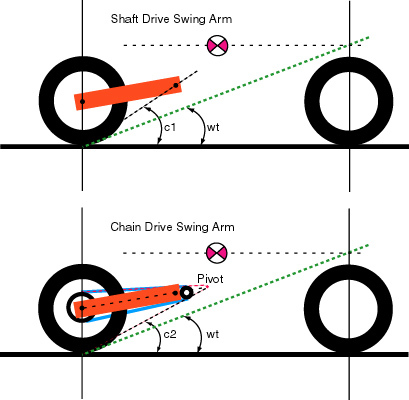 It is the result of the location of the pivot point defined by the intersection of the lines defined by your swing arm and the top of your chain (belt). If you draw a new line from the rear contact patch to that point you will have defined the 'chain angle' of your bike. This is shown as 'c2' in the drawing below. 'wt' is the weight transfer angle for the bike (which is merely the height of your CG divided by your wheelbase). You will note that the chain angle is larger than the weight transfer angle. Thus, when you accelerate you will decompress your rear suspension and the reverse is equally true, when you brake you will compress the rear suspension. Now, because the mass of the motorcycle body is so much larger than the mass of the rear wheel, when you brake hard with the rear brake, the wheel will be lifted instead of the bike squatting onto it. That reduces traction and the result, 'chirping' of the tire or, as he said, skidding and squalling. The diagram above shows the forces involved that account for this behavior. The blue arrow is the vectored braking force that removes weight from the rear wheel while the green arrow is the vectored braking force that removes weight from the rear-end of the motorcycle as a result of weight transfer. Note that the rear wheel has lost more weight than has the rear-end - in other words, it will RISE farther than will the rear-end and compress the rear suspension as a result. Unless he adds a substantially larger tire (mass wise) he cannot overcome the tendency of the rear tire to be pulled up off the ground by the rear suspension during hard braking using the rear brake. Now, the real issue is 'hard braking using the rear brake', not that the rear tire chirps when doing so. IT IS NEVER, EVER - NOT ONCE IN YOUR LIFETIME - APPROPRIATE TO AGGRESSIVELY USE YOUR REAR BRAKE. The dynamics of your motorcycle make it foolish to do so as that immediately limits the amount of braking you can do (leaving a great deal of stopping power unusable) because of lost traction. Worse, of course, it leads to YAW of the rear-end and that, in turn, leads to high-sides. If you use the engine to slow you down the pivot point I mentioned earlier is defined by the intersection of the swing arm with the BOTTOM of the chain instead of its top, but the result is the same, though diminished in magnitude. But if you are paying attention it explains why it is so easy to skid your rear tire if you downshift and release the clutch too quickly or have a significant mismatch in engine speed and tire rotation speed. I add this tip because it is my opinion that the rear brake is the most dangerous control you have on a motorcycle and thinking that you can make it work better by increasing the size of the rear tire is simply asking for trouble if you don't change your braking methods.